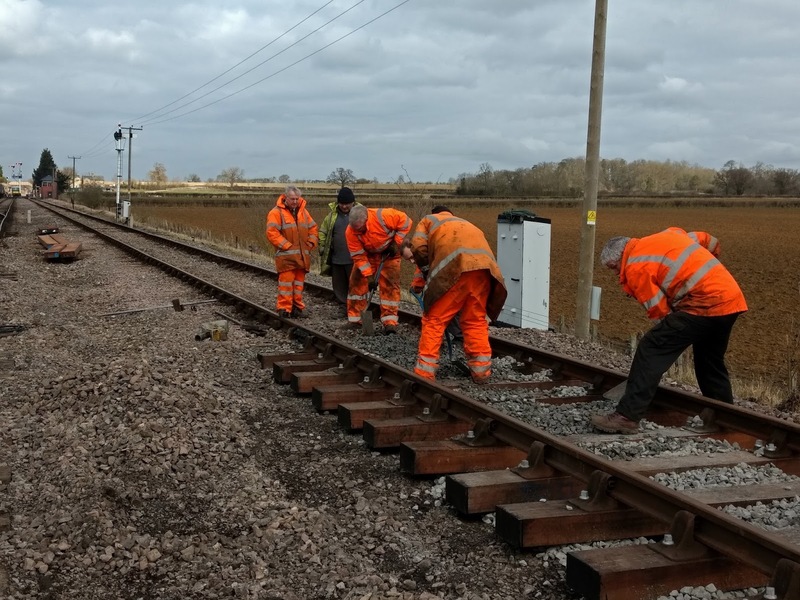 A modest gang of 13 booked good progress today with the installation of the two turnouts at Toddington. For once the weather was kind, it was cold but sunny all day long. Our prayer last week was answered! We split into two today, with one gang off to Broadway to replace a number of temporary fishplates with proper lifters. Job done, they came down to Toddington south to help the main gang with screwing down, ballasting and packing the main line turnout completed last week. It was hard work. A large pile of heavy jacks faced us at Toddington by the mess coach, after enjoyable times with tea and doughnuts. Now came the reckoning ! The six heavy jacks all had to be lifted on to the Landie. Don't all volunteer at once... John, last in line, is doing an imitation of Edvard Munch's scream: ' Nooooooo'. 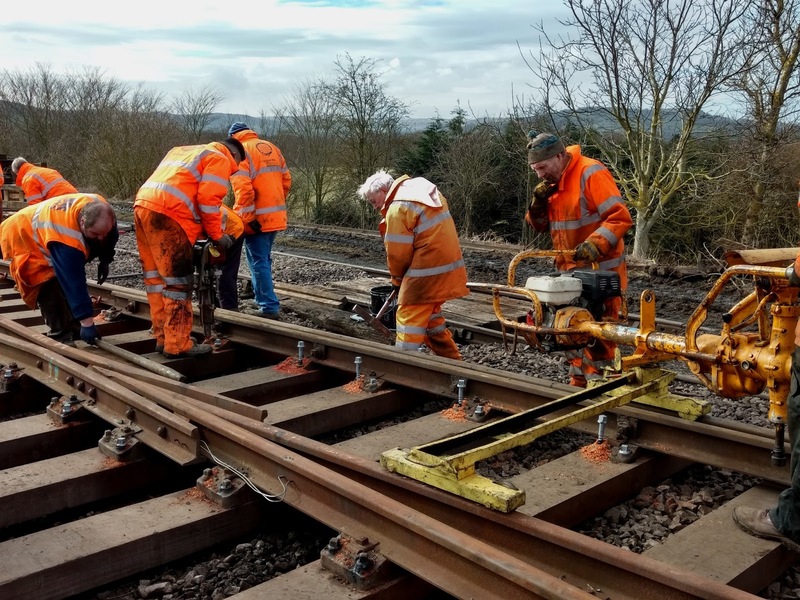 On site at Toddington south the first job was to drill the holes for the check rail on the curved road. If only things were so easy. Just fill the drill with two stroke, and start it. But it won't start. 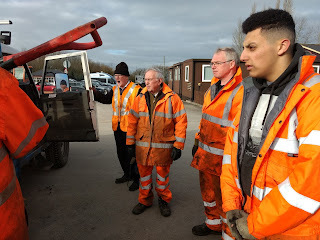 Various experts had a go, choke on/off, petrol on, ignition on, pulls, is it flooded, check the plug - the plug turned out to be only hand tight in its hole, but also had a large lump of goo across the terminals, which proved to be the reason for the non starting. At last we are off. Because we can't all stand and watch Hayden drill the holes, some of us were detailed to start packing the panel of plain track we laid last week. 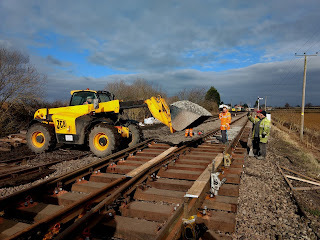 The Telehandler brought large bucketfuls of new ballast from the car park at the station. Newbie Jack and A.N. 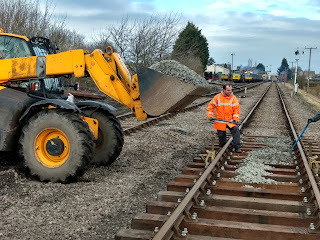 Onymous on the right start to shovel the ballast this way and that. It's quite hard work. Eventually all the other gang members drift off to discuss an inconsequential matter, leaving only one man to plough on, oblivious. Have you finished yet? The drilling is now going swimmingly, closely followed by the man with the greasy chair screw and another with the hammer. The TB2 nut runner waits nearby for its turn. 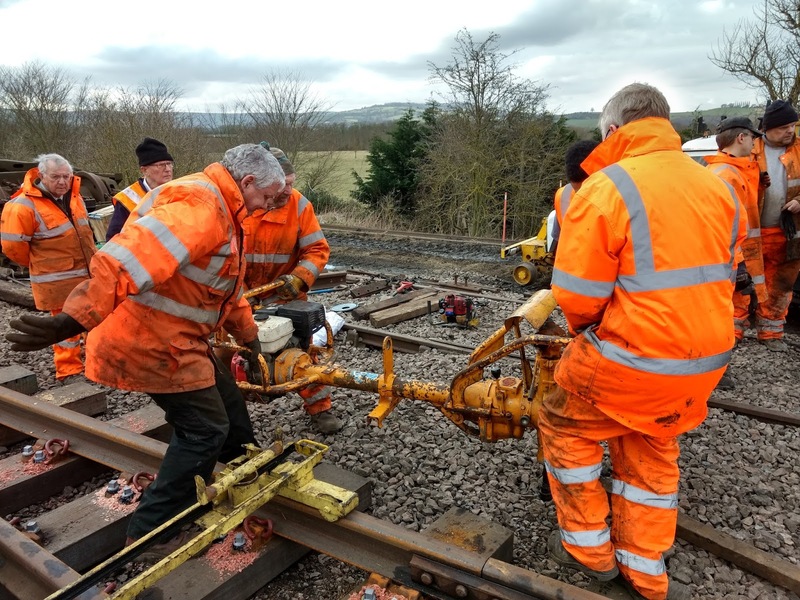 Bolting down done, the nut runner is now in the way and needs to be moved to the adjacent siding. That's a six man job - one on each corner of the nut runner, and two on its trolley. 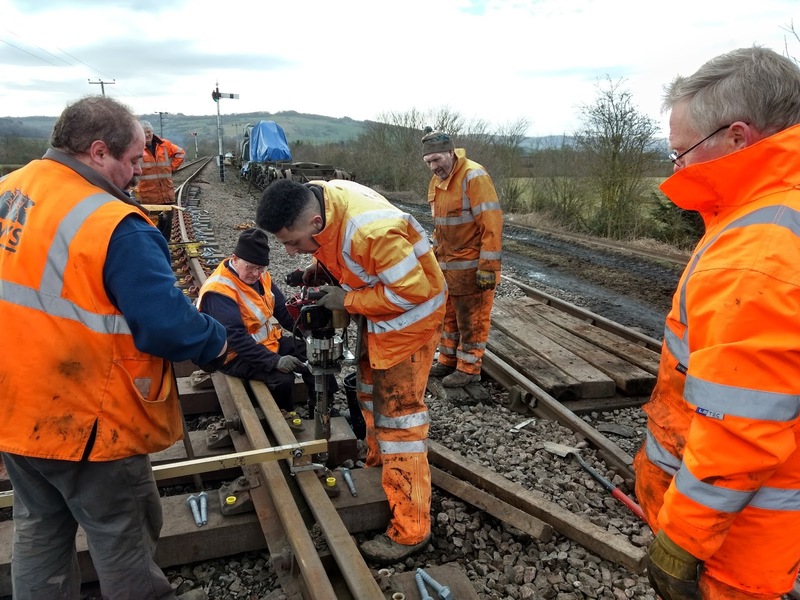 With the bolting down of the main line turnout finished, attention turns to ballasting of both the plain panel, and the turnout itself. 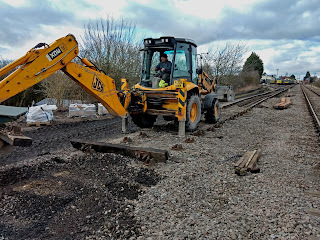 Ballast is brought in initially by the Telehandler, and then, later, also by Steve in his JCB. We start to sweat - can the hand packers with the shovels handle the pace of the arrivals? They came thick and fast. Hardly had we dealt with one load than another appeared. 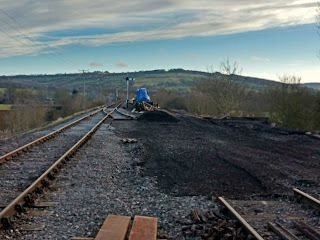 We pushed the fresh ballast well under the sleepers, then filled the cribs between them. On the left is the new turnout, placed at the level of the through road. On the right is the headshunt from the yard throat - much lower. Beyond, bits of class 47 on wagons, stored along the siding. 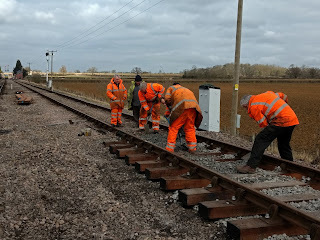 While a large gang continued with spreading the ballast, a smaller one helped Steve with the start of phase 2: The second turnout, for which two panels of plain track had to be removed. The bullhead rail on throughbolt sleepers was unclipped, and Steve then pulled it out with the trusty JCB. Did you know you can do this with a length of bullhead rail? It is much more flexible than flatbottom. Steve gave it an almighty pull, and it then slid out of its chairs and was stacked further along. In front is the end of the new turnout, pointing to where we will work next. 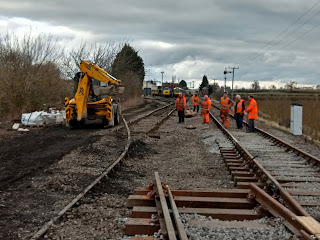 After packing and ballasting the plain panel of track, we moved along to hand packing and then ballasting the turnout. Alan brought bucketful after bucketful of ballast, and after a while had to adopt increasingly angular approaches to get the load in the right place. Luckily the arm extends as much as 2.5m, so he was able to reach the far side from quite far away. 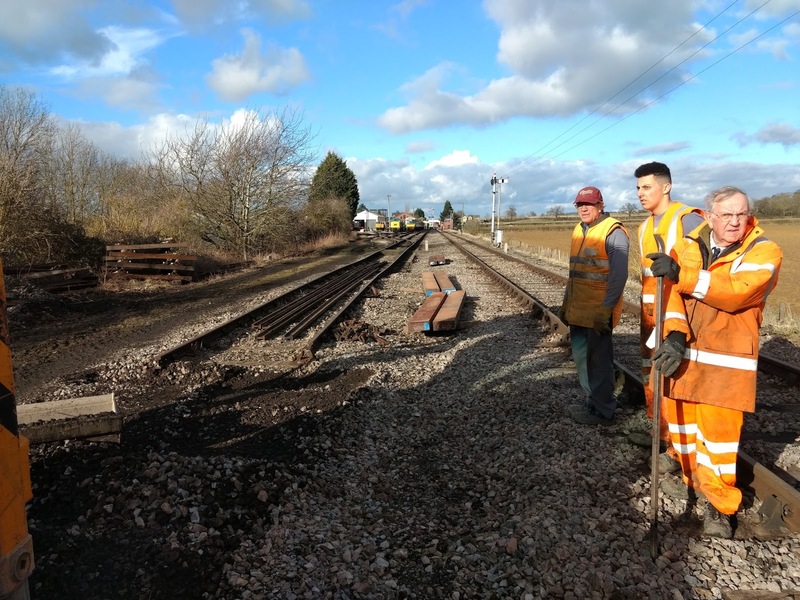 With the 4 old rails out, Steve began to remove the sleepers underneath as well. He pulled them all out of their beds with the back hoe, working his way along. 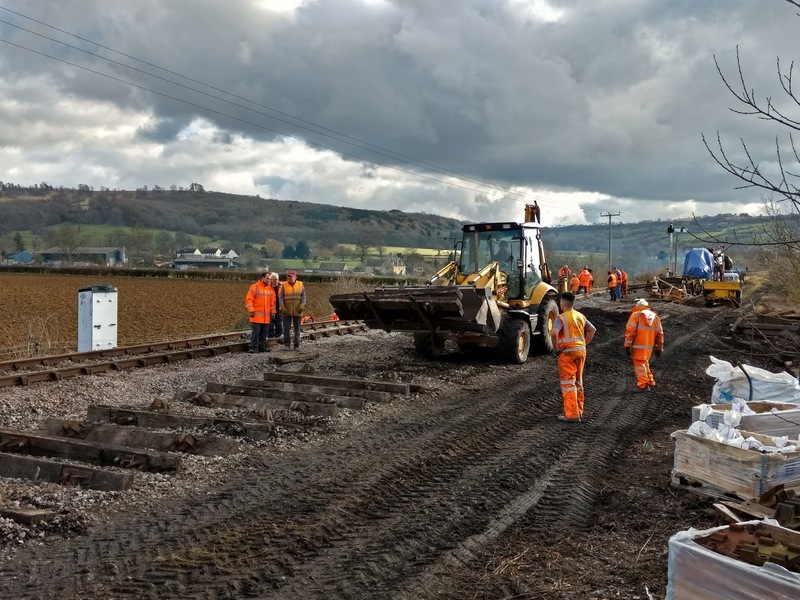 With the 4 rails and 52 sleepers out of the way, Steve was able to start scraping out the trackbed in anticipation of the construction of the second turnout here. 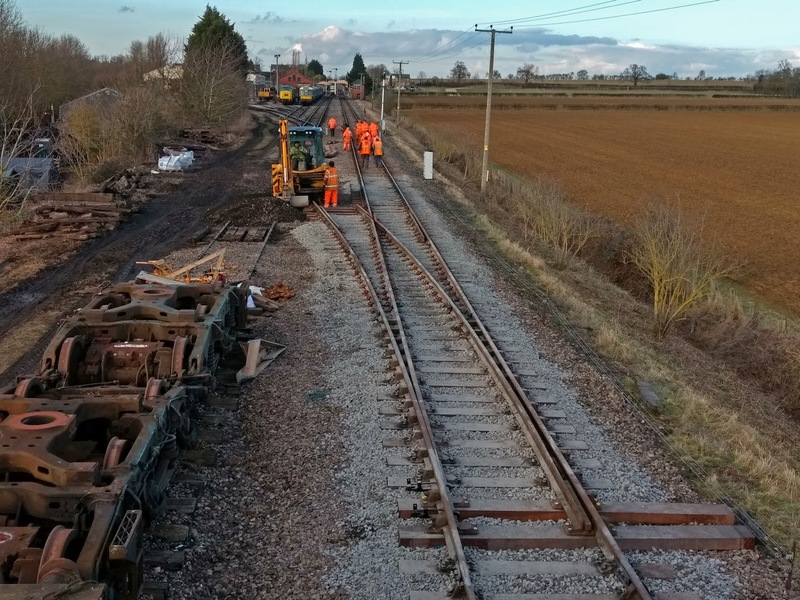 This is still at Laverton, and was awaiting the completion of the first turnout, so that the parts can be brought down by rail. 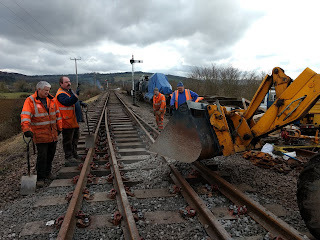 At the end of the day Steve was scooping up the spent ballast (we say ballast, it was ash with stones in fact), a reminder of the early GWSR days when you packed with what you could. This section needs to rise by several inches, so we did not dig too deep. Here is the closing view for the day. The new turnout is fully bolted up and hand packed and ballasted, with considerable human effort. 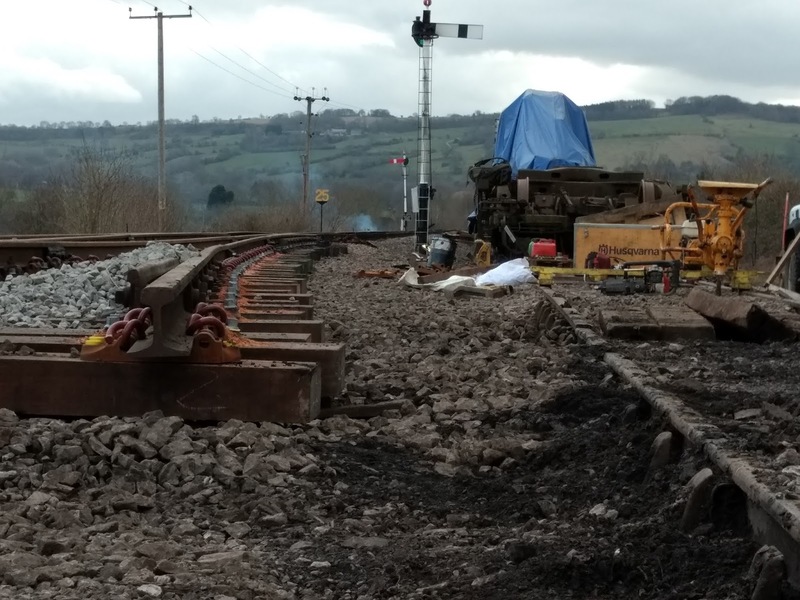 The two sleepers in the foreground are waiting for S&T to do their work, fitting the spreader bars to the blades and a sole plate to hold it all together. 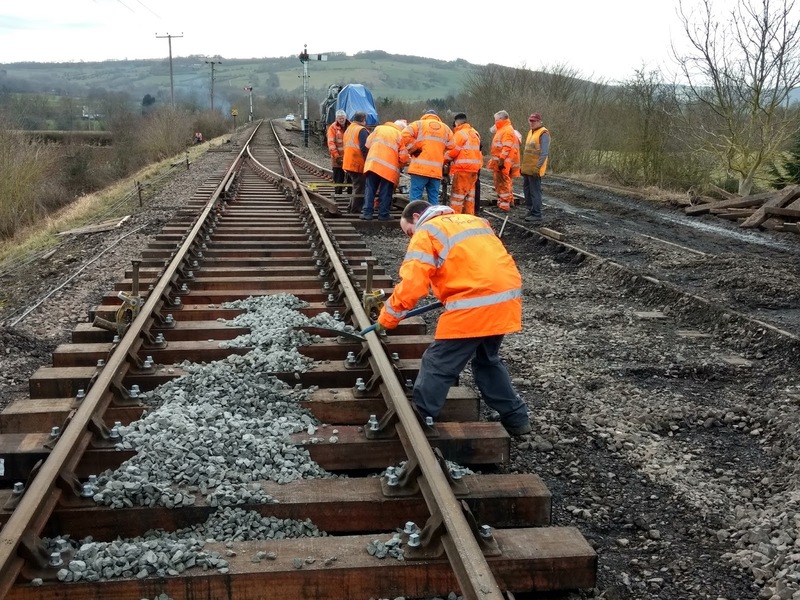 The extension of the sleepers on the right is for the fitting of a point motor. A rather blurry picture looking south at the end of the day. Light is failing and shutter speeds are slow. You can see the bed of the second turnout excavated on the right. 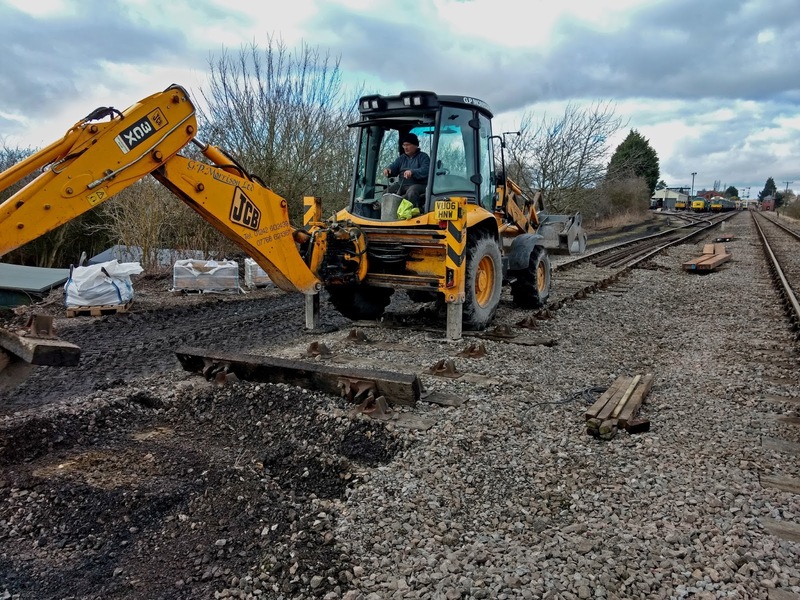 Providing the actual parts of it manage to arrive by rail from Laverton, we will make a start on this next week. The key element of this excercise is however the through road on the first turnout, as that is critical for the resumption of services in March. We are pretty much on plan for that. On the way back we dropped into Broadway. Two volunteers are providing three 3 legged scripted benches, exactly right for the 1904 opening period. There will not be any memorial plaques on them. There are very few, if any, 3 legged benches on the railway, as most sponsors go for the cheaper and unauthentic two legged versions, which came much later. The wood for the benches has arrived and has been sealed with knotting fluid. 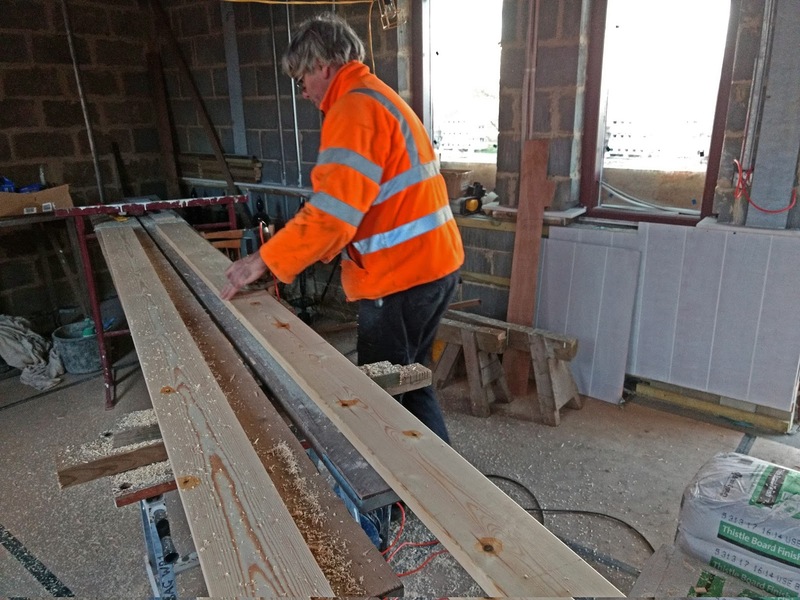 Here Neal is using a router to round off the square edges. The planks are 10ft long, instead of the 6ft commonly seen. Three such scripted benches can be seen in this 1904 picture of Broadway. We would be interested in any letters for V boards as in the picture, if there are any about. Also a pointing finger, as on the WAY OUT sign. Well done on the turnout. Ballasting by hand is not a pleasurable job, - very warming though! Just the thing not to wish for on a warm day! Good work going on at Broadway with the seating. If it is of any help, two GW locations both sport good examples of finger boards. 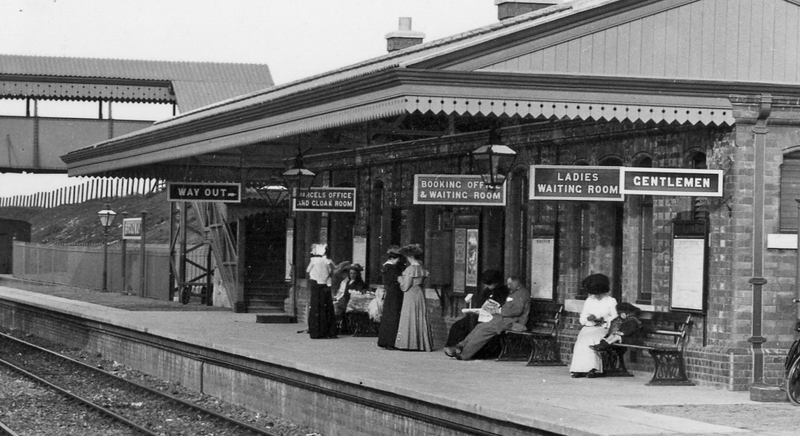 Birmingham Moor Street and Kidderminster Town. All hopefully authentic in scale. I am sure good copies can be arranged by talking to the right person? All the down pipes on our line were square and set into the brickwork. Unfortunately there was no will to replicate this. I had noticed this detail too, but I thought that given the cavity walls to meet modern building regs, having inset down pipes would a) cause 'cold bridges' in the insulation (verboten), and b) might cause damp penetration risk and frost damage at a later stage, so felt that the external downpipes were a reasonable compromise. 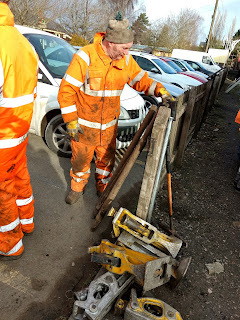 If you're looking for letters for the 'V' boards it might be worth contacting this firm https://www.steelway.co.uk/rail/section/heritage-railways as they provided much of the heritage equipment, including the signs, for the refurbished Moor Street station in Birmingham. It's amazing how true to the original station the Broadway build has been. Granted one or two details were just not practical to replicate, but looking at it from an overall perspective the atmosphere it evokes already seams almost exactly the same as that in this old photo. It will be even more the case as they start to strategically plant period details like signage around too. Very much looking forward to a trip down the line, with a greatly reduced journey to the line from home thanks to only having to drive to Broadway now, in note very many weeks time...! We do indeed use shovels, but a new, pointed version has been added to our tool store and in some circumstances these are indeed easier to insert into the ballast. We have some of the V boards for Broadway station, sourced from auctions, but not always the right wording. For example, we have two WAITING ROOMs. In the interim, whilst you re searching for lettering for the 'V' boards, you could have them sign written, temporarily, by someone who does that sort of thing. C&W comes to mind. Then the boards can be fixed to avoid any delay. Just a thought. Even Didcot cheated and painted some of the letters on. But why not try and get letters? In the event that you try Steelway for the letters and find them too expensive why not ask the C&W lads if they can make some wooden patterns so you can have them cast? Glad you had some decent weather. You seem to have been ballasting the hard way ! Well it looks good, but I don't know how the men with the shovels are feeling today. Aching limbs ? I shouldn't wonder. 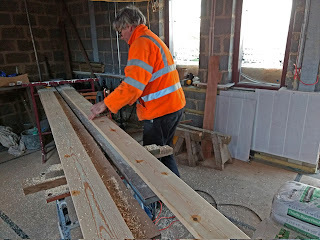 I can see how you are going to construct the second turnout, but I can't see how you are going to overcome the height difference with the running line. Oh well, I'm sure you'll manage it somehow. Though I can't think how. And then it will be off to Gotherington to relay the track over the bridge. There's no rest, is there ? Good luck to all the PW team. I'm guessing that the height difference will be overcome by ballasting and tamping the lower line. In any event, it will all become clear soon enough as long as this excellent blog continues. 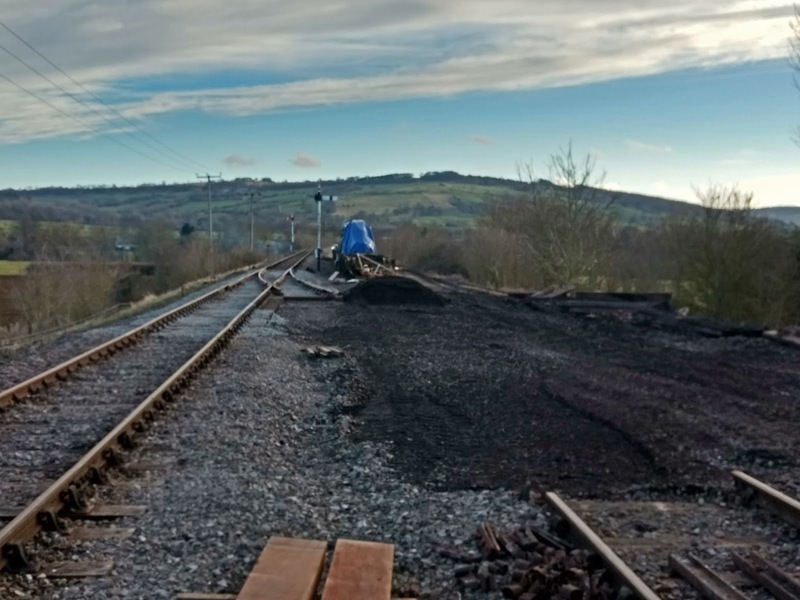 Does Her Majesty's Inspector of Railways (or whatever they are now) have to inspect and approve the extension before it goes into public use - or does their remit not cover heritage lines? Yes, he does. The HMRI now come under the ORR, although most of its staff continue to refer to themselves as Her Majesty's Inspectors. And, yes, their remit certainly does cover heritage railways ! If the Education & Training Regulator is OFSTED & the Water Regulator is OFWAT why isn't the ORR known as OFRAIL? I think we should be told! Toddington Ted. Why isn't the ORR known as Ofrail ? Oh dear, I think that is a question for Sir Humphrey Appleby ! P1 "will this fence support the kit and me if I lean on it?" P5 " I will pinch this ballast while they are looking the other way!" p15 " We are sure the track was here this morning aren't we?" 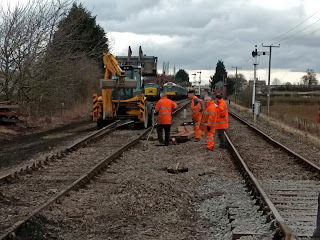 Any way great that you had improved weather for the day another good days work by you all, when this bit is done it will be down to Gotherington to do the bridge connection, hope the weather stays dry for you there as well. 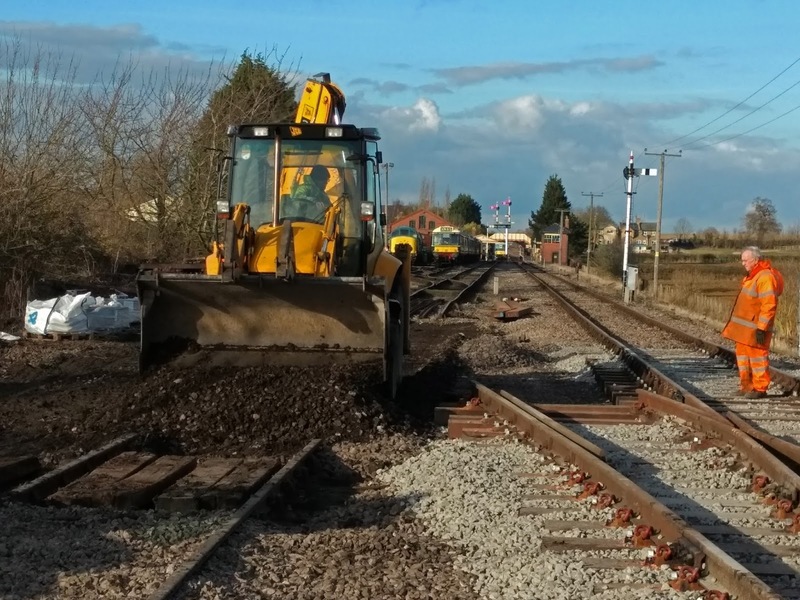 It will be the second turnout a n d replacing the track at bridge 34 a n d tamping the extension this week. Wonderful picture of the original station. I realize that everyone has more than enough to do already but can't help wondering whether you are having a row of slabs behind the copings as shown? Perhaps I am imagining things! Thanks Jo for a very speedy reply. No need to be sorry ,I am full of admiration for what you are achieving. Is that the ballest regulator on P2 at broadway?